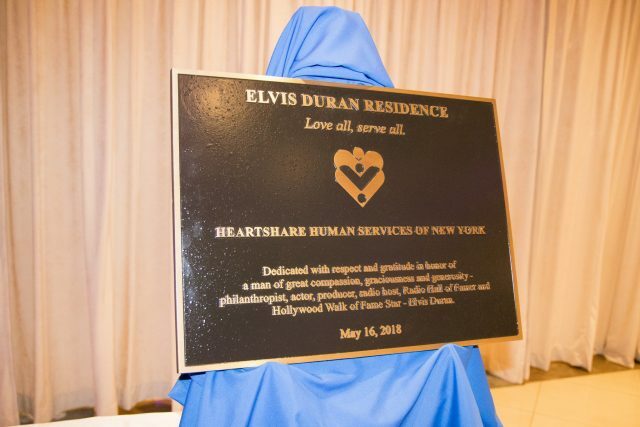 The dedication plaque for the newly minted Elvis Duran Residence in Midwood, Brooklyn shares one of the radio host’s favorite quotes: “Love all, serve all.” Duran was a HeartShare Gala honoree in 2016. (Brooklyn, NY)—HeartShare hosted a dedication ceremony for its 66th Street Residence in Midwood, Brooklyn on May 16, 2018, which celebrated how the residence has become a home for four men with autism. The home opened two years ago to David F., David K. (“Mookie”), Terrance, and Justin, who men with autism in their 30s. The residence was named for Z100 Radio Host Elvis Duran, who was honored at HeartShare’s Gala in 2016. Duran is a philanthropist and advocate for LGBT, arts & theater, and animal rescue organizations throughout New York. Linda Tempel, HeartShare Executive Director of Developmental Disabilities Services, Z100 Radio Host Elvis Duran and Bill Guarinello, HeartShare President and CEO, were joined by community members and advocates for the opening of the home, such as (far left) Mary Grace Giuliano, OPWDD Metro NY Director, Regional 4 Office. David F., who is 33 years old, knows the Duran Residence as his home. “We visit David almost every weekend and no matter where we are, he always wants to return to his housemates. It really is a great comfort that David considers HeartShare his home,” shared his mother Amy. David has known his housemate Justin since he was a child and now, they are living at Duran Residence together. “‘Mama’ Claudia is a DSP at Justin’s Residence. We call her that because Claudia treats all the young men at the residence as if they were her own,” Michael shared. HeartShare’s residential programs are not only a relief to aging parents looking to secure long-term care for their adults children, but alleviates the constant anxiety that comes with daily caretaking. “When you are the primary caretaker of a child with special needs, there are many restrictions imposed on a parent’s routine. With my son at the residence, I’m experiencing a sense of freedom, flexibility and calmness that I haven’t felt in a long time,” shared Amy. 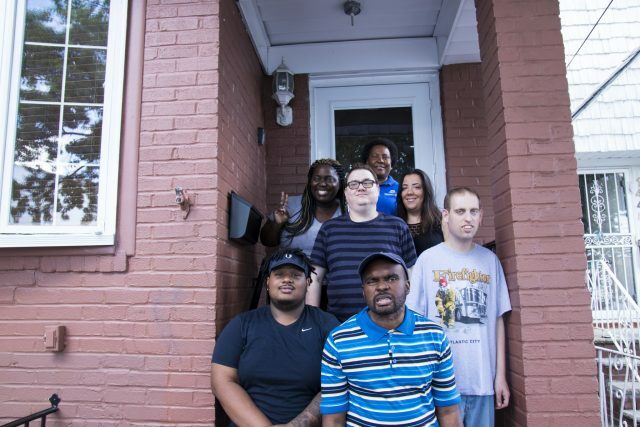 Three of the original residents (from top center) David F., (front right) Justin, and (front center) Terrence with HeartShare managers & staff when the Midwood home first opened in 2016. 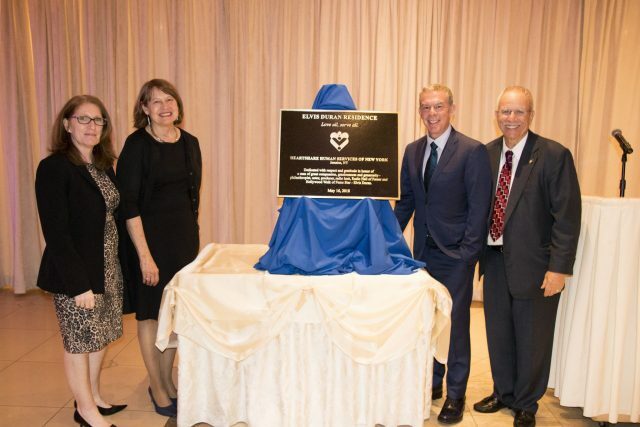 The home was dedicated on May 16, 2018 to Z100 radio host and philanthropist Elvis Duran. “It was such a relief for Terrence to find a home. I put Terrance on a residential waiting list when he was just 10 years old,” said Helen Murphy, who is Terrence’s grandmother and primary caretaker since he was 18 years old. She credits the HeartShare staff with Terrence’s growing independence, which includes bi-weekly performances at Co-Lab Theater Group. “I offer the staff accolades for their work. I’m over 70 years old and I can say from experience—it’s a very hard job,” Helen added. Families are still very much involved. “We are so happy with Mookie’s progress. He’s more at ease in his new home and we can see him 2-3 times each week,” said Howard, father to the 24 year old. Residential options for people with disabilities are scarce, but when David’s family found out that HeartShare might be opening another residence, they jumped on the opportunity. “My family and I used to drive nearly 600 miles roundtrip twice monthly to see our son,” recalled Howard. “Now, at Duran, he’s a matter of blocks from our home.” Mookie was living in a residential program in Utica, New York. “The staff helps me FaceTime with David, so I can see him during weeknights even though I live a little farther away now,” said Amy. “I visit Terrence about 2-3/week and call him every night to say goodnight. As long as I’m around, he will never be alone,” said Helen. To learn more about HeartShare’s residential options, call 718-422-4200 and ask for our Intake & Admissions Department.